This Princess is from my city Austin,TX!!! 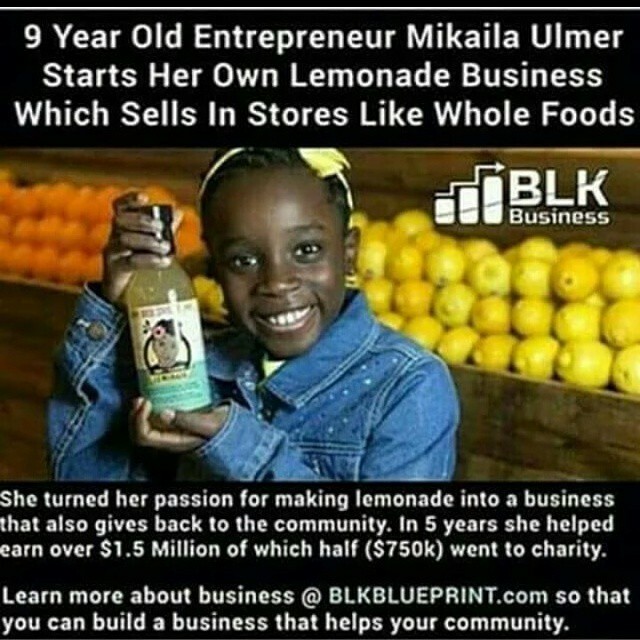 Shout Out to this beautiful young Princess@beesweetlemonade Mikaila for becoming a successful entrepreneur at the age of 4. Now at age 10 this awesome Princess not only sells lemonade but she leads workshops on how to save the Honey 🐝!!! Check out moor of her story, products, events, and much moor on her website http://www.beesweetlemonade.com! You can also purchase her delicious lemonade in Wholefoods stores!!!! For moor Youth in the Spotlight check out http://www.savingtheyouth.com Or if you know a Youth that should be in the Spotlight please contact me @ savingtheyouth@hotmail.com! Posted in Saving The Youth Stars™Tagged Abundance, africa, Afrikan, Ancient, black, creative, dream, dreams, Education, entrepreneur, fun, goals, growth, happiness, happy, health, inspirational, inspire, jobs, joy, knowledge, learn, learning, Life, love, Motivate, motivation, motivational, Peace, positive, Prosperity, Proverb, special, spirit, spiritual, Stars, success, talent, teach, teen, teens, wealth, wisdom, wise, words, work, youth, youth unityBookmark the permalink.